The FCC has been working with 13 major broadband providers in the US, from February to June of this year, to test how the ISPs' actual broadband speeds matched up what they advertised. The results? You're probably not getting the speeds you expected, for better or for worse. 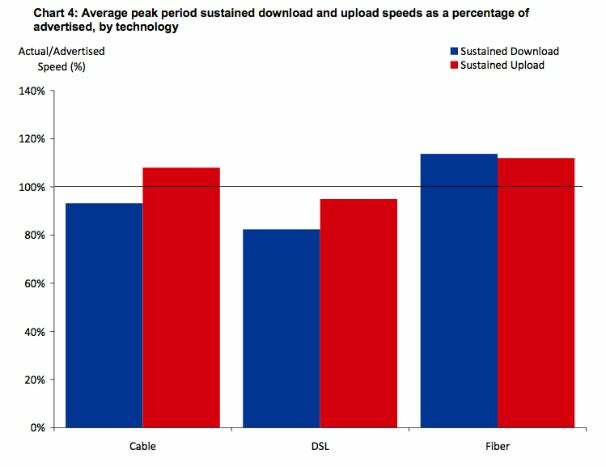 The FCC ran tests to see which ISP technologies did best during peak periods, and Fiber trounced everyone else, averaging download speeds that were 14 percent above what was advertised. Meanwhile, DSLaverages 82 percent and cable sits at 93 percent. 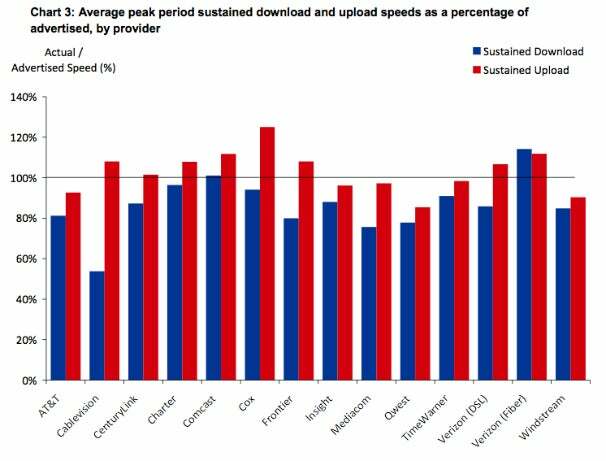 Upload performance was generally better, and all the technologies met 95 percent of their advertised upload speeds on average. As for the providers, you can see in the chart above that Verizon Fiber (FiOS) and Comcast are the only ones providing above-advertised speeds. The other services were generally at 80 percent of advertised speeds or better, but were almost never above the advertised rates. The full text of the study, with more graphs and stats, is available for download on the FCC site. How did your ISP fare? Leave a comment.